These all look to you, to give them their food in due season. When you give it to them, they gather it up; when you open your hand, they are filled with good things. Eating “in-season” … it’s Scriptural and, therefore, we should take a good hard look at it! When we were in England several years ago, my Daughter-in-Love received a box every week from a nearby farmer with vegetables that were just then harvested by him. Many of them I had never seen before, let alone eaten, but he put in recipes and directions about how to prepare the vegetables in the box. I thought, then, that it would be fun to get vegetables from farmers instead of only in grocery stores. Later, there were so many stories of Hep C, bacterias, and all sorts of illnesses traceable to tainted food, so I decided to check out getting produce from a nearby farm to minimize the number of hands that touched the produce that we ultimately ate at our dinner table. 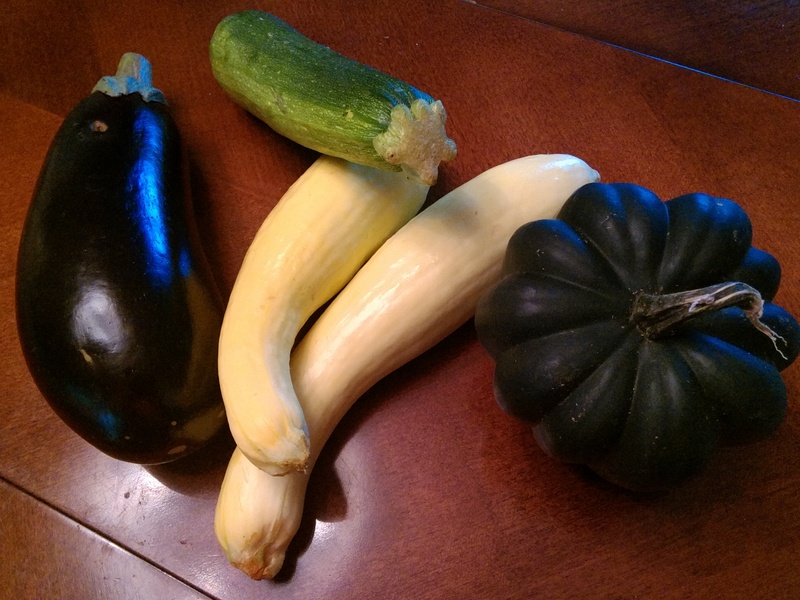 Eggplant, Zucchini, Summer Squash and Acorn Squash from vegetable box. I did some reading and discovered the Community Supported Agriculture (CSA) movement. Basically, you buy a share of the farmer’s crop by paying a monetary amount in January or February, thus becoming a shareholder in the crop for the year. Then, when the farmer’s produce begins coming in, you receive a box of vegetables directly from the farmer once per week. The box contains some of each of the crops ready for harvest so you are eating with the seasons. And, you receive some vegetables that you may never have purchased in the grocery store, thereby expanding your culinary tastes to include more veggies than corn! 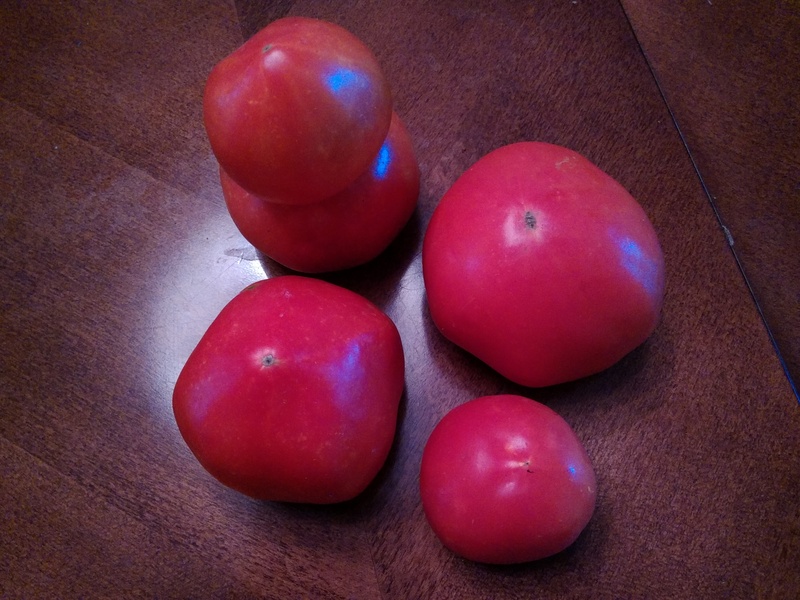 Juicy Tomatoes from vegetable box. We received our vegetable box today and I was prompted to think about living in the moment. Eating in season, eating what the Lord has provided today, not craving for what will be coming later. Being satisfied with today’s provision. For some, this is a very different mindset. 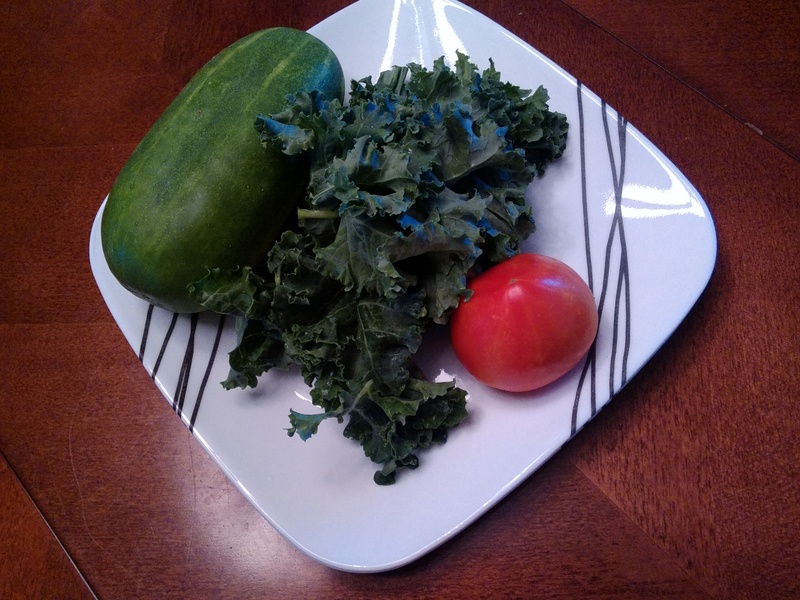 Cucumber, Curley Kale and Tomato from vegetable box. The Hebrews in the wilderness learned this lesson when the Lord provided manna and quails for them to eat. In Exodus 16:15-26 we read about when the people were first introduced to manna. It was found on the ground in the morning and they were instructed to gather enough for each person in their house to eat for that day. They were not to save anything for the next day, unless it was the Sabbath – if they were to do so, in the morning they would find worms and decay rather than fresh manna. In other words, they were instructed to eat one day at a time – and to eat what was provided in-season for them. Later, when they were no longer in the wilderness, the Lord instituted the feast of first-fruits where the people were to offer the first fruits from the harvest to the Lord. They still ate in-season. In Matthew chapter 6, Jesus said that we should not worry about tomorrow, about what we should eat or wear, because our Heavenly Father knows that we need these things and they will be provided. 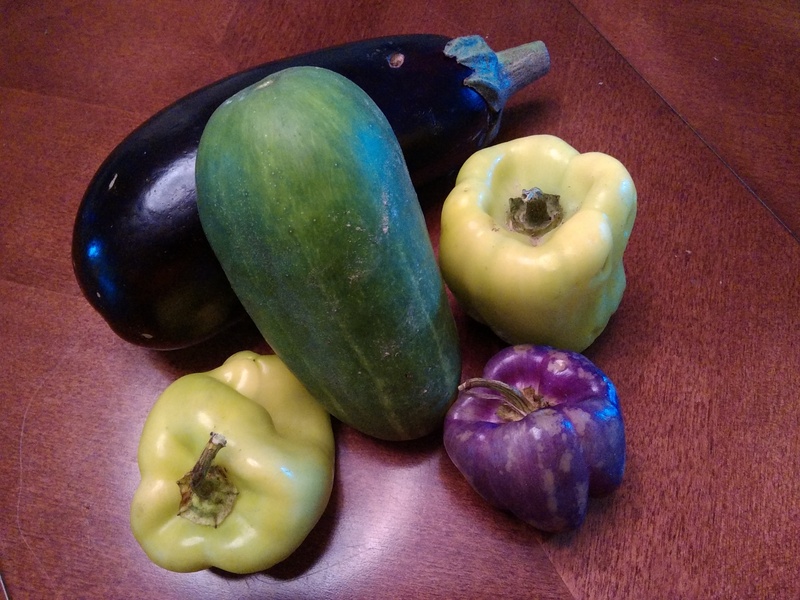 Eggplant, Cucumber, Yellow and Purple Peppers from vegetable box. Eating our vegetables from the box has been fun for us and it has taught us a renewed appreciation for the variety that God has provided for food in His world. I would encourage you to consider participating in a CSA. Alternatively, I would encourage you to eat vegetables that you can purchase from farmer’s markets as they will be fresh and the variety from the crops will encourage some tasty changes to your family’s menu! Praise the Lord for the provision of food that is found in abundance and in a variety that creates exciting mealtime adventures.